Kaisilver Custom Gold Rings, Fine Craftsmanship In 14k Or 18k Gold. We often receive queries from visitors to our website asking whether, a specific ring can be made in gold or silver. The simple policy at Kaisilver is that, all jewelry including rings for men and ladies, can be ordered in gold or 925 silver. Being one of the very few high end custom jewelry providers, to deliver the same quality for silver and gold jewelry, we place no limitation on design or gemstones. This implies two interesting and important things, your gold ring requirement need not be limited to the designs that you see on our website and your, gem selection can go well beyond what we show or mention on the site. As far as the alloy karatage for gold rings is concerned, we generally get orders for 14k and 18k gold rings. You would notice that, all the price tables on the website, quote prices for 14k or 18k gold and sterling silver. It is not common for jewelry lovers to request for 10k gold but, should you need your gold rings to be crafted in 10k gold let us know and we will send you a specific price quote. And do we provide an option for 9k gold rings, the answer is no and here is the explanation. Manufacturing jewelry involves the preparation of alloys, this alloy needs to be processed in batches in order to reduce process (weight) losses. Unless your gold ring order has enough weight for a complete batch, much of the 9k gold alloy that we prepare for you needs to be reprocessed into, 10k, 14k or 18k gold. This is because, U.S which is a major market for jewelry does not, allow the description 'gold' to be used for an alloy that, has a lower gold content than 10k. If you have a requirement for 9k gold rings in small quantities we would suggest that, you go for 10k gold since the price difference is really not very significant. The beauty of gold rings can be enhanced with the right selection of colored gems and the color of the gold itself, can do much to make a ring more desirable. Having said that, we should clarify that there is no best metal color for a gold ring - it all depends on personal choice and likings. The colored gold alloys are stable and durable when the metal color is white, yellow or rose (pink) and these are the options that we provide. The price remains the same for all these gold colors so you can, follow your fancy. Just to mention, fancy gold colors like black, green and purple have been made but, these alloys lack the durability that is seen in the three conventional colors (yellow, white and rose). 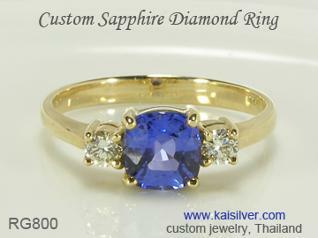 Kaisilver can custom make gold rings with your designs or those, picked from our website. The design, dimensions and gem type, shape and size can all be decided by you. We do not rely on ready made molds and blocks to make our gold rings, each ring is worked on by expert artisans and crafted from beginning to end. Since our gold rings are designed and crafted to give equal importance to external appearance and durability, you will notice that we invest significant gold weight in every ring. It would therefore be unfair to compare prices of our gold rings, with those of other providers by doing a simple comparison of appearance. Designs from our website, or your own images and sketches. 14k or 18k white, yellow and pink gold. Quote on request for 10k. Fine craftsmanship, custom cut gems and no limit on gemstones. Emphasis given to appearance and durability. Gold weight generally 40% to 60% more than what others provide. Custom made in all ring sizes, dimensions can also be customized. Contact our experts at sales@kaisilver.com with any questions or requirements that you might have. Since you need not make any purchase to get the benefit of our expertise, we would urge you to contact the team before making a buying decision. Review Our Ring Collection .... Here.